The Kings and Queens Funeral Services has labelled as a ‘hoax’ – an incident in which a Johannesburg based pastor claimed to have raised a man from the dead. 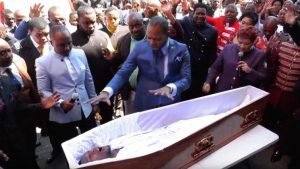 A video showing Pastor Alph Lukau of Alleluia Ministries, went viral on social media – after he claimed to be praying for a dead man who he then resurrected. The Kings and Queens Funeral Service’s vehicle was used to ferry the alleged deceased man to the church. The funeral service’s spokesperson, Giyani Dube, explains their version of Sunday’s incident. Three funeral parlours have announced that they have approached the police to investigate the matter. The companies have been criticised for their alleged involvement in the incident. The companies say they are victims of misrepresentations by the so-called Prophet who wanted to display his would-be supernatural powers. The post Pastor raising man from the dead a hoax – Funeral service appeared first on SABC News – Breaking news, special reports, world, business, sport coverage of all South African current events. Africa's news leader..